This KOMA Chart from Oklahoma City, OK, circa 1964, holds a few surprises, kicking off with this week's #1 Record ... "Shaggy Dog" by Mickey Lee Lang, a record barely managed a Top 40 showing in Billboard (#38) that year. In fact the entire Top Ten seems to be all over the board ... "Last Kiss" by J. Frank Wilson and the Cavaliers is at #2, followed by Lorne Greene at #3 with "Ringo" and Dean Martin with "The Door Is Still Open To My Heart" at #4. Travis Wammack is in the Top Ten with "Scratchy" and so is Elvis (who holds at #10) with "Ain't That Lovin' You Baby". The lone British Invasion Top Ten Hit belongs to Chad and Jeremy with "A Summer Song", which drops to #9 this week. Looks like KOMA opted for the George Jones version of "The Race Is On" ... it sits at #13. Jack Jones (no relation) typically had the pop hit while George's "raced" up the country chart. It ranks just below this week's highest premier, "Have I The Right" by The Honeycombs, a record that had already topped our charts here in Chicago. It's also kinda cool to see Nat "King" Cole at #20 with "L-O-V-E", a song that has since become a pop standard, despite stalling at #81 in Billboard, who favored the flipside, "I Don't Want To See Tomorrow." 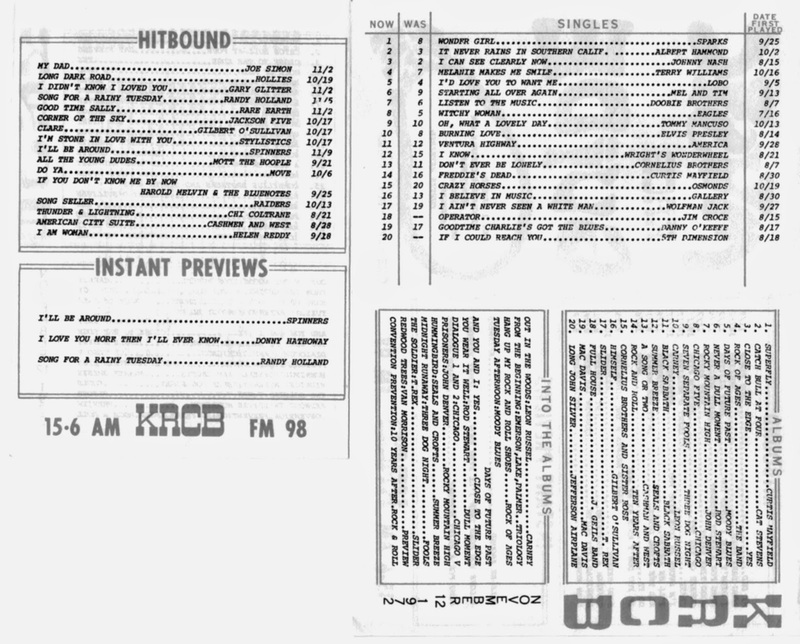 KOMA showed both titles as a two-sided hit. Talk about a radio station that went its own way ... check out this KRCB Chart from 1972!!! The #1 Record belongs to Sparks with a track called "Wonder Girl" ... the best this record was able to do in Billboard was "bubble under" at #112!!! You'll also find some recognizable fare here ... the usual hits by The Doobie Brothers, The Eagles, Elvis Presley, America and Jim Croce ... but some of these off the wall titles DEFINITELY make you take a little bit closer look at this chart!!! "Do Wah Diddy Diddy" by Manfred Mann is the highest charting British Hit this week on The Billboard Hot 100 Pop Singles Chart ... it sits at #3. "Have I The Right" by The Honeycombs represents the only other British showing in The Top Ten at #6. Slowly climbing the chart are "Tobacco Road" by The Nashville Teens (up from #15 to #14), "Everybody Knows" by The Dave Clark Five (up to #15 from #19), "I Don't Want To See You Again" by Peter And Gordon (which climbs to #16 from #20), "I Like It" by Gerry and the Pacemakers (up one position from #18 to #17), "I'm Crying" by The Animals (up two spots from #21 to #19), "You Really Got Me" by The Kinks (which leaps from #32 to #20), "She's Not There" by The Zombies (up from #45 to #22), "Time Is On My Side" by The Rolling Stones (up to #29 from #46), "I'm Into Something Good" by Herman's Hermits (rising from #57 to #41) and The Searchers with their latest hit, "When You Walk In The Room" (up from #58 to #44). Still hanging on but working their way DOWN the chart are "A Summer Song" (now #21, down from #13) and "All Cried Out" by Dusty Springfield (down from #41 to #43). That still gives The British Invasion Artists 14 of The Top 44 songs, a solid 32% of the chart some ten months into their reign. WLS continued to list just The Top 30 Singles on their Silver Dollar Survey ... the other ten positions were reserved for their new R&B Music Survey list. Topping the list this week is The Shangri-Las' hit "Leader Of The Pack", a position it will hold for another week before being dethroned by the break-through hit of yet another British Invasion artist. You'll find NINE Top 20 Hits by British acts as you scale down the chart ... 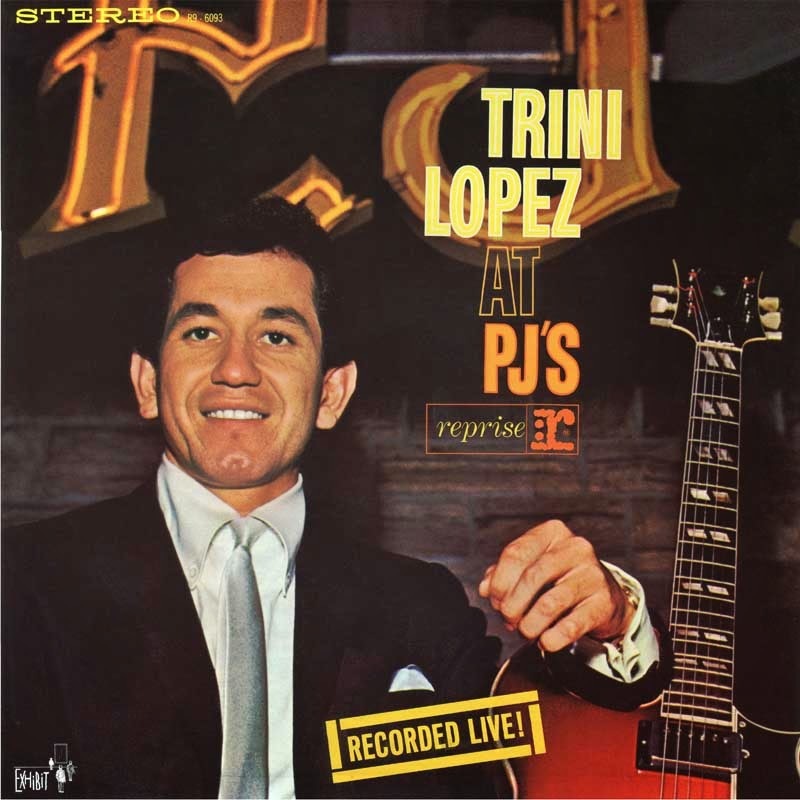 The Kinks are at #4 with "You Really Got Me", followed by "Have I The Right" by The Honeycombs at #5 and "Tobacco Road" by The Nashville Teens at #6. Manfred Mann is still holding on to a Top Ten spot at #8 with their big hit "Do Wah Diddy Diddy", followed by "I'm Into Something Good" by Herman's Hermits at #9. At #11 you'll find "I'm Crying" by The Animals. The Zombies are at #13 with "She's Not There", The Dave Clark Five sit at #15 with "Everybody Knows" and Peter and Gordon round out The Top 20 with "I Don't Want To See You Again" at #18. The Overlanders climb to #21 with "Don't It Make You Feel Good" and The Rolling Stones premier at #29 with "Time Is On My Side" ... all happening this week in 1964. Radio today has so greatly distorted "The Greatest Hits Of All Time" that future generations won't have a CLUE as to how things REALLY went down ... and which songs and artists REALLY made a difference. (Unfortunately, The Rock And Roll Hall Of Fame isn't helping matters either by ignoring acts that made HUGE contributions to the development and advancement of rock and roll in favor of their own personal favorites. Who made a bigger long-term impression ... Chicago or NWA? The Guess Who or Leonard Cohen? The Moody Blues or The Smiths??? The other day we ran links to Rich Appel's new series currently running in Billboard Magazine, offering a "revisionist look back at history in order to show which songs and artists made the longest lasting impact on society. Several major artists were dethroned along the way ... The Beatles' break-through American Hit "I Want To Hold Your Hand" fell to The Animals' version of "House Of The Rising Sun" ... "Hey Jude", #1 for nine weeks in 1968, now falls short of the Jimi Hendrix version of Bob Dylan's "All Along The Watchtower". Worse yet Billboard has shifted all of their focus to post August 4. 1958, the date The Hot 100 Pop Singles Chart began. In effect they eliminated Elvis Presley's first 28 chart hits in one swoop, deeming them in process insignificant. These include TEN #1 Records ... records that LAUNCHED Rock And Roll like "Heartbreak Hotel", "Don't Be Cruel", "Hound Dog", "All Shook Up" and "Jailhouse Rock". Kudos to our FH Buddy Jim Peterik who places at #3 with "Eye Of The Tiger", his #1 Hit with Survivor from the movie "Rocky III". Science is tackling "Eye of the Tiger" now! My younger brother is always wanting to play just a second of a song in the car for me to name that tune when we go on trips. I manage it most of the time ... mainly because he chooses songs we both love and have heard one million times, even though some of these may often be obscure records to others. That said, yesterday, a scientific survey was released showing "Eye of the Tiger" as the third most "catchiest tune" ever. The study will help evolve into working with people with Dementia. Personally, I must be getting dementia, since I do not KNOW songs 1, 2, and 4. I DO live way in the past?? Are these catchy? Ya got me. I just could pick them out in a second, I think -- AND they are great ones! Well, I will admit to knowing most of these ... although their 12,000 person study must have consisted of primarily people under the age of 25 - 30 for so many of these recent hits to rank as high as they do. "Wannabe" by The Spice Girls? Yeah, I get it ... but I can't even REMEMBER the last time I heard it on the radio. "Mambo No. 5"? Yep, good choice, but again not a real big one on any of the play lists that I listen to. I still hear "Eye Of The Tiger" at least four or five times a day ... the Lady GaGa song, too. I'm a little surprised by "SOS" because it's "Dancing Queen" that they play to death ... at LEAST 15 times a week. "Oh, Pretty Woman"? That's been on our "Over-Played List" since the day Forgotten Hits started! Who plays "It's Now Or Never" anymore? I can't find a radio station that'll touch a song pre-1964! "Mmmbop" too by Hanson. "Rivers of Babylon" by Boney M??? Where'd they conduct this poll, Great Britain? How is it that when a group or performer released a "two-sided" hit single each side of the record had a different "song position" on the charts? Like HEY JUDE got to #1 while its flip REVOLUTION got stuck in the top 20 somewhere. The same with PAPERBACK WRITER / RAIN. Why was PAPERBACK WRITER #1 but RAIN was only a "minor hit"? Or the Joey Dee and the Starliters' 1962 single HEY LET'S TWIST made the top-40 but its flip ROLLY POLY didn't. Or, say, the Beach Boys 1964 two-sider I GET AROUND / DON'T WORRY BABY. It doesn't make sense to me. Both songs are on the same record, but each side charts differently. But it wasn't possible to buy said record without getting both songs at once. So how were they able to determine which side was the "bigger hit" side? Did the record companies or those who produced the charts routinely hire people with certain telepathic aptitudes which enabled them to read the minds of some 20,000-some record buyers so as to assess which side of the single was the one being "favored"? And how were these telepathic employees able to zero in on just a multitude of teenage record buyers and no one else? I've never understood it either. Obviously you could measure the airplay of each side of the record ... but how would ANYBODY on God's Green Earth know which side of the record drew the buyer into the store in the first place and made them lay down their hard-earned cash to pick up these latest hits??? I have ALWAYS listed two-sided hits as sharing the same chart position when compiling my own charts. (And sometimes the "A" side of the single would change during the course of a given record's chart run.) It seemed to be the only fair way to do it. But all three major trades listed these sides separately for most of the rock era. Check out our Top 200 Biggest Two-Sided Hits Of All-Time Chart ... reflecting the ACCUMULATED points earned by BOTH sides of each given record. (As such, you'll find some surprises here ... such as the one you mentioned above ... "Hey Jude" peaking at #1 for nine weeks ... but "Revolution" only peaking at #12. Without question, "Hey Jude" was The Beatles' biggest single here in The States ... but now it falls behind "Come Together" / "Something", which peaked at #1 and #2. Their 7-week chart-topper "I Want To Hold Your Hand" places at #22 on our list due to the #14 showing of "I Saw Her Standing There", a record that TODAY you're FAR more likely to hear than the A-Side. That puts it behind other Beatles Two-Sided Hits like "I Feel Fine" / "She's A Woman", "We Can Work It Out" / "Day Tripper", "Penny Lane" / "Strawberry Fields Forever" and even "Love Me Do" / "P.S. I Love You"!!! The other day we told you about some of the great Christmas Concerts they've got coming up at The Arcada Theatre ... GREAT artists like Ronnie Spector, The Ides Of March, LeAnn Rimes and The Nelsons (with The Cowsills) to name just a few. (Full details on the OShows website: www.oshows.com). The Genesee also has Kenny Rogers tomorrow night and The Temptations Review featuring Dennis Edwards on Saturday. Other shows include Judy Collins (for one night only on November 16th) and The BoDeans will be appearing at BOTH theaters with back-to-back shows on December 27th (The Arcada Theatre) and 28th (The Genesee Theatre), with special guest star American Idol Winner Taylor Hicks. I truly admire Darlene Love. Beyond her magnetic and majestic voice, she clearly has a great sense of loyalty. "(Christmas) Baby please come home" has been around for over a half century. But let's get real ... the show is inexorably linked with David Letterman. It's a video gem I look forward to ever year and frequently dig on youtube. When Dave walks, its appropriate that Darlene should discontinue the tune as part of the CBS Late Night format. It just wouldn't be the same with a different host. You can always see how much Letterman admires Darlene. Side note ... when I took my first legit sportscasting job on WISH TV, ch. 8 in Indianapolis back in September, 1974, the first guy who interviewed me on radio was a hip young dude named David Letterman. About two months later, he was off to the west coast to begin his historic TV journey. Darlene Love??? How many tunes did she sing for the Ronettes that people in fact believe were sung by Ronnie? Last but not least, I'll be emceeing the Bears - Packers game on the wide screen at Ronnie Onesti's Arcada Theater in St. Charles on Sunday ... also signing "special discounted" copies of my book "Chet Coppock: Laying it on the Line." Hope to see some of our FH members at the event. That means you, Kent!!!! None other than Peter Blair Denis Bernard Noone, the Artist still known as Herman, turns 67 Today ! I'm writing to let you know about our 'Philly Pop Music" documentary series. Please take a moment to check it out on Indiegogo: http://igg.me/at/phillypop Also share it with all your readers. All the tools are there. Get perks, make a contribution, or simply follow updates. If enough of us get behind it, we can make the "Philly Pop Music" documentary happen! Philly Pop Music will have an opportunity to preserve the history of Philadelphia's diverse musical community to the world in a way that does it justice. It's a huge gift to everyone who loves music, and You can be part of the process!!! It includes interviews and commentary from: Rock & Roll Hall of Famers Gamble & Huff, John Oates (Hall & Oates), Joe Boyd (producer - Pink Floyd, Nick Drake, Hendrix), Billy Paul, Earl Young (MFSB), Bobby Eli (MFSB), Kevin Bacon, Michael Bacon, George Thorogood, Linda Cohen, Pat Martino, Al Kooper (producer - songwriter), Laurie Anderson, Rufus Harley, Tommy Conwell, Robert Hazard, Kenn Kweder, Byard Lancaster, Odean Pope and many more. Plus we have a few more lined up for new interviews ... stay tuned! Your contribution will help us complete our first Philly Pop Music series and have the DVD included in the Rock Hall, Library and Archives where scholars, historians, journalists and the general public may have access to the film. We plan to release the film as a series by decades ... 60's, 70's, 80's, etc. Other Ways You Can Help: If you are unable to contribute, you can help by emailing our link to your friends and sharing this information on Facebook and other social media sites. MONKEES.NET CELEBRATE 20 YEARS - HAPPY BIRTHDAY! 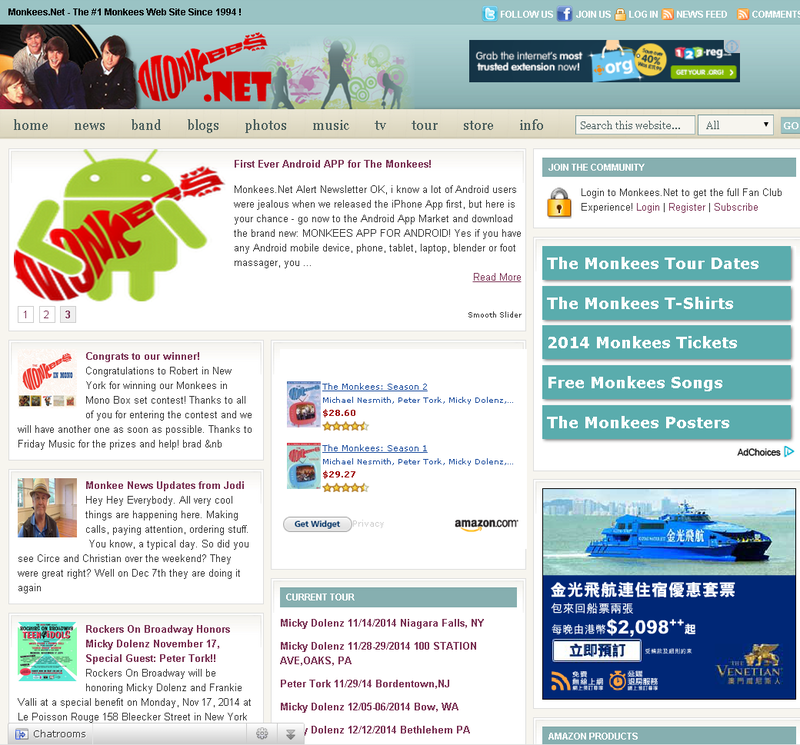 “In 1994 when the old menu systems of the Internet began to give way to the new form of HTML web pages, I built the first Monkees-web site and listed it on Yahoo and it was popular immediately because of the ability to share photos, recordings and a few videos.” Waddell says he’s met fans from all over the world and feels flattered that his site has become something of a common ground. 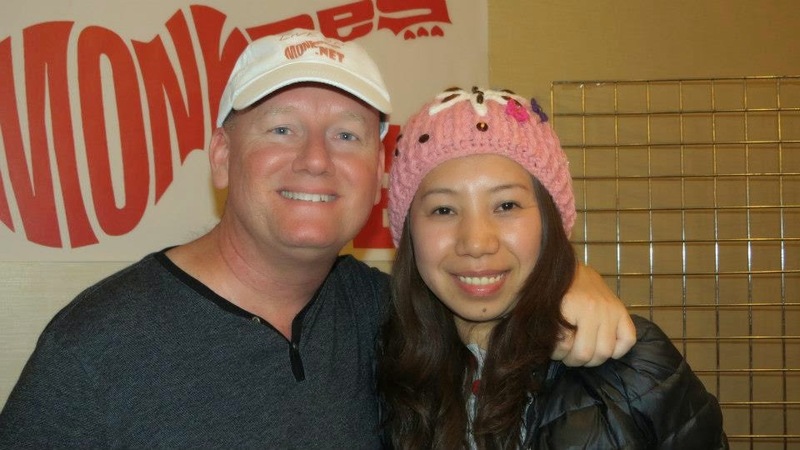 Waddell’s plans for his site next week is to run a contest with prizes, and to print several essays from some of the key-Monkee-resources, including authors Eric Lefcowitz (Monkee Business) and Mark Bego, who co-authored Dolenz’s 2004 book I’m A Believer. Waddell says that the biggest joy and accomplishment is having met each of the band members and having them embrace his efforts. “It has been 20 years and the Monkees still are in my music rotation bringing happy memories of Monkee weddings between fans, great friends and humorous romps like the true story of what happened to Mike’s wool hat,” says Waddell. Earlier in today's posting we told you about Judy Collins' upcoming appearance at The Genesee Theatre in Waukegan, IL. Now comes word of a brand new record release as well! Folk Icon Judy Collins Releases A New 2CD Career Retrospective with Guest Appearances by Joan Baez and Stephen Stills! Includes her most beloved songs and interpretations such as “Send In The Clowns,” “Cat’s In The Cradle,” “Both Sides Now,” “Amazing Grace” and many more! Los Angeles, CA - Her distinguished voice carried a troubled nation through one of the most tumultuous decade of the 20th century, and continued to inspire millions of music fans for many decades to come. Now, the magnificent Judy Collins proudly presents a new collection of timeless classics, 28 gorgeous songs on 2CDs, that capture both the breadth and depth of Collins’ vast catalog of original songs and unforgettable interpretations. With superb guest performances by fellow folk icons Joan Baez and Stephen Stills (of Crosby Stills & Nash), Both Sides Now - The Very Best Of will be made available on November 4 courtesy of Wildflower Records in association with Cleopatra Records, Inc.
As its title suggests, this wonderful collection showcases both sides of Judy Collins’ extraordinary talent as both a gifted songwriter as well as a skilled interpreter of other’s material. “My Father” and “Albatross” are excellent examples of Collins’ distinctive song-craft - intimate, melodic, and profoundly emotional. These very same qualities have also helped Collins breathe new life into such standards as “Send In The Clowns,” “Amazing Grace, and “Over The Rainbow” truly making these well-known favorites her own. Fans young and old, newcomers and loyal backers alike, will find a lot to love and even more cherish on this incredible compilation! Stuart Shea's Monteras story/interview is very well done and is a fun read. Thanks to Clark for letting us know about it. And of course thanks to Forgotten Hits for being the vehicle that brings us all this great information! Whenever Mom plays Johnny Cash, her twins do THIS! (You can't watch this clip and tell me its not another clip of the week, to add to my resume. Can you? LoL! I spoke to Freddy Cannon over the weekend. I'm happy to report his voice sounded better and his energy level had improved a bit. When David Letterman ends his 30-plus-year late night career in 2015, his smirking wit won't be the only thing missing from television -- it will also mark the end of an annual holiday TV tradition. Every year since 1986, Darlene Love has performed her 1963 girl group classic "Christmas (Baby Please Come Home)" on the last episode of Letterman before Christmas. In a recent interview with the Rock and Roll Hall of Famer, Billboard asked Love if she would consider moving the annual performance to a different late night show. "This would be my 28th year in a row," Love says, speaking to Billboard backstage at a charity concert honoring Joan Jett. "They never told me not to, but it was an unspoken thing. They couldn't ask me not to sing 'Christmas (Baby)' on another show, but after 10 years, then 15 years, of doing this one song on this one show, I felt I had an obligation to be true to them." I WANT TO THANK YOU FROM THE BOTTOM OF MY NEW HEART FOR ALL THE KIND WORDS YOU AND YOUR READERS SAID ABOUT ME. ALL THEIR PRAYERS DID WONDERS FOR ME. YOU ARE HE BEST! ALSO THANK YOU FOR HELPING ME GET THE ACETATE OF "SHE'S MY ROCK AND ROLL BABY" ... YOU HELPED ME PROVE THAT MY MOM AND MYSELF WROTE THIS SONG. AGAIN, THANK YOU ... FORGOTTEN HITS IS THE BEST! Thanks, Freddy ... SO good to hear from you ... and SO glad to hear you're feeling better. I'm not giving up until you're healthy enough to bring your show out here to Chicago!!! That's great that you heard from Joe Tarsia, one of the most talented recording engineers in history. No one was ever better at combining the sound of a tight rhythm section with a "big room" orchestral sound ... and that is what people are referring to when they cite the classic "Philly Sound." I can't tell you how many legendary producers and engineers I've talked to who have referenced Tarsia or his work. As Mr. Tarsia said, a majority of the Philly International stuff was cut at Sigma Sound, but there was a lot done at Sigma Sound South at 309 S. Broad Street in the '70s and '80s in the way of demos, overdubs, vocal tracking and full-blown sessions. And hey, that studio should have gotten historical designation just by virtue of "The Twist" having been recorded there! So yeah, pin Joe down for a chat; a definitive interview with him would be fantastic. Despite the incredible reputation he already has, he's truly one of pop and soul's unsung geniuses and a cornerstone of Philadelphia's musical legacy. Is it me, or could Glen Campbell's new release, "I'm Not Gonna Miss You" be a Jeff Lynne song? ELO drums and even his style of singing, not Glen's. Still, a nice song. I happened to hear Scott Shannon on K-Hits this weekend when I was driving into work Saturday Morning. 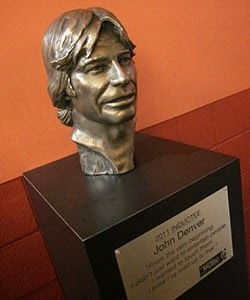 You're right -- I had absolutely NO idea that he was going to be back on the radio here in Chicago again. I listen to K-Hits all the time but never heard one single advertisement about this new program coming on the air. Any chance Scott Shannon will return to the airwaves full time here anytime soon? Proof again that you just NEVER know who's reading Forgotten Hits! After FH Reader Frank B mentioned the story Scott told on the air last week about The Charlie Daniels Band, we heard from their manager ... who helped correct a portion of the story. And check out THIS cool video clip of Neil Young visiting "Baby Shannon" in the studio a few years back!!! Lots of FH fans will remember this film about Neil Young "Journey Through The Past." Late one Friday night in the fall of '71, Neil and his film crew visited Scott Shannon at the WMAK / Nashville studio. The entourage enters the control room at 4:29. The people out in the elevator lobby, the station reception area, and in the narrow hallway, and the photos on the wall, all bring back memories for us Nashvillians. Bobby Wood died five months after Jimi was kidnapped so it had nothing to do with finding out whether Jimi knew anything about the reason why Wood was killed. More likely Wood was killed because he knew too much about Jeffery's relationship to the mob and their interest in Hendrix. Jimi had almost no alcohol in his blood at his autopsy, which proves he did not mix drugs and wine. Jimi was definitely murdered as any serious investigation of the circumstances around his death would show. You simply can't have lungs and stomach full of wine and only have a 5mg blood alcohol content like Jimi had. There wasn't really a "variety of drugs" found in Jimi's system. There was just the Vesparax barbiturate Monika gave him and one Black Bomber speed capsule. Forensic experts said it wasn't enough to kill him, but that's not what killed him anyway. It was being drowned in a large volume of wine as Dr. Bannister witnessed. It is with great sadness that we, Jack’s family, announce the passing of our beloved Jack: husband, father, granddad, and all round legend. The world of music will be a poorer place without him, but he lives on in his music and forever in our hearts. I cannot begin to tell you what a GREAT influence he had with his songs on my brothers and me. The second and third psychedelic albums were phenomenal! His singing was phenomenal. If you listen to the Cryan Shames' "Greenburg" I think you can see "White Room" influences in it. I wanted to send you this great photo taken by Alice Mansueto (wife of 1910's Mick). 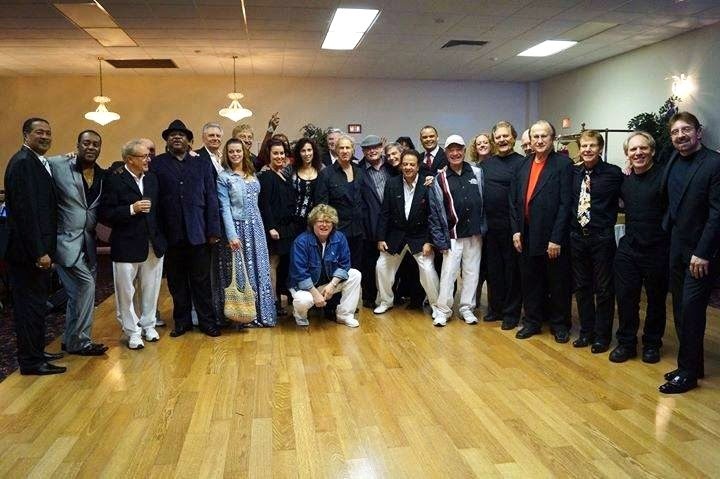 It was taken after the show we played in Bensalem, Pa. This photo includes Dennis Tufano, Ron Dante, The 1910 Fruitgum Co., The Rip Chords, Vito Picone, John Kuse, and a few others. It was a great night. I'll be in touch again soon. I LOVE Variety Magazine (newspaper). They did have a chart that was cool to see in the magazine stores always. I have many old Variety Magazines and they, like Radio & Records in the 80's, were very much into the entertainment areas including printing a top 60 chart in the mid-60's. A friend sent me this link. I didn’t know this show was filmed. 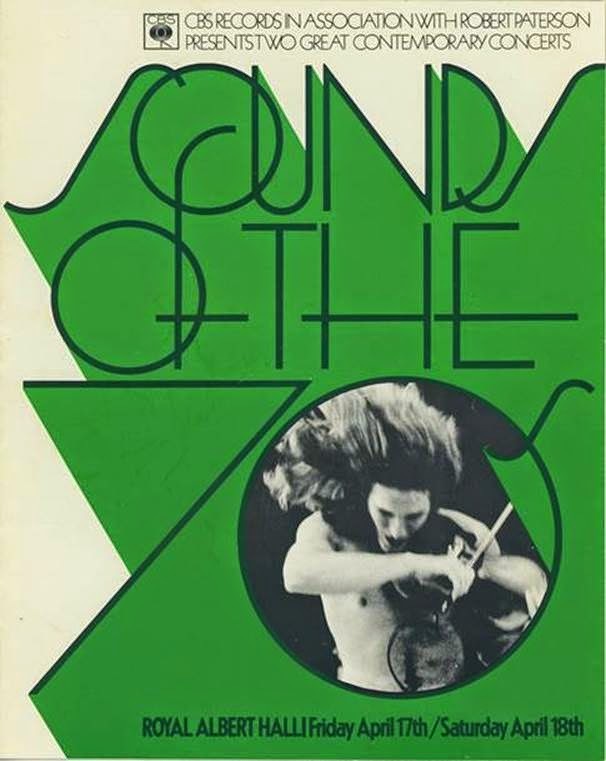 This is a video from a concert we played at Royal Albert Hall London in 1970. I’ve attached the program cover and insert page about the group. 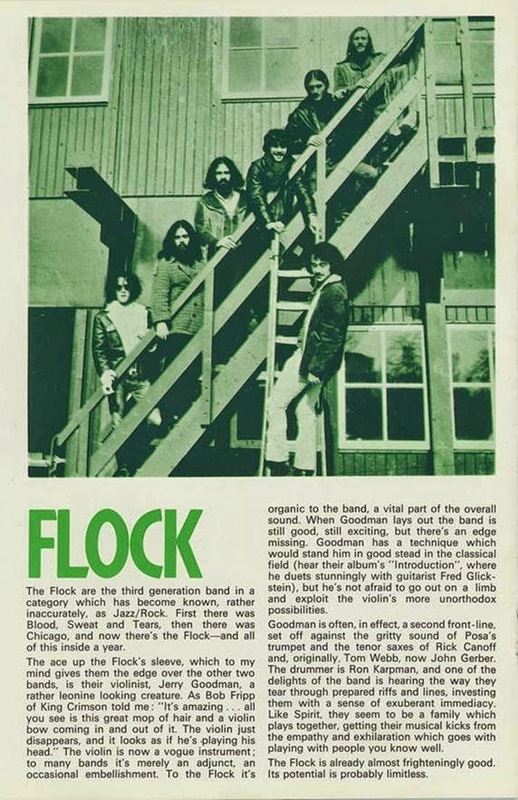 If you only want to watch Flock – we start at about 18 minutes into the video right after Santana. If you only want to hear my solo, it starts around 25 minutes into the video, although I am playing throughout the song. The audio is very soft, so you will need to turn up your volume. 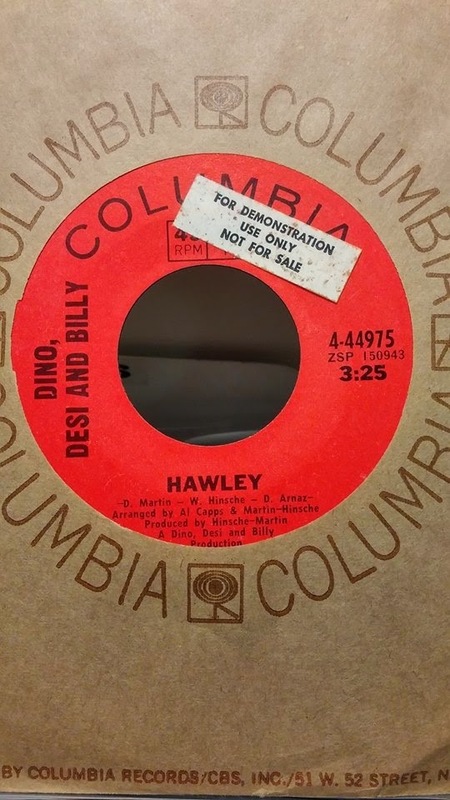 A couple of weeks ago we featured the track "Hawley" by Dino, Desi and Billy in our Saturday Surveys feature. Billy Hinsche just sent us this picture of this very rare pressing ... after the band left Reprise Records and moved to Columbia Records in the late '60's. Thank you (and Clark Besch) for running the Cryan' Shames' version of "Tobacco Road" ... I remember it well. When Jim Fairs launched into that 'I had a dream the other night' - that made it a Cryan' Shames song for me. No one else did it quite the same in my eyes! Thanx for posting - good to hear it again. Among your Tobacco Road remarks, you didn't mention Lou Rawls' version -- to me, this will ALWAYS be the definitive rendition - to me. Yes, Jerry G was a friend of mine before his death as well. WGN's Nick Digilio has ALWAYS done great remembrances of local radio / music talent and did so with Jerry G as well. This did come out as a Kapp 45 in 1969 between their Parrot and Warner releases, but went nowhere. However, this demo is much clearer than the 45 release version. The Ides will be doing their annual Christmas Show at The Arcada Theatre on Saturday, December 13th. In fact, Ron Onesti has quite a few Christmas Shows coming up this season ... including LeAnn Rimes December 18th, Ronnie Spector December 7th, The Nelsons (with special guests The Cowsills and The Cadillac Casanovas) December 5th, and more. Be sure to check out the oshows website at www.oshows.com. I am sending along an email a good writer friend of mine, Stuart Shea, who has written a brand new piece on a Chicago 60's garage band. He goes very in depth with his research, making it hit home to me and many of you involved in music back then. YES, even I performed in a band in 1964 at my Presbyterian Church. OK, it was in Dodge City, Kansas, not in downtown Chicago ... but THIS band story goes through the teen member changes, making a record on legendary clique Chicago small label Orlyn Records (I personally like the Graf Leppelin best of these), band contests, band choreography steps, band name changes, and many of the types of gigs you all may remember going through. They still have the master tape! Great photos and band ads -- and you can HEAR the record for free. It's great that he found ALL the members to get input from each and coordinated it so well into a great story you can all relate to. I'm including this to people who had SO many of the same adventures. Farfisa players, 60's girl rockers, Orlyn fans, collectors, 60's Chicago band members, Hop DJs, fans, managers, song writers, etc. You can find something for each of you. One even had his band evolve from "Good Lovin" to Vanilla Fudge just like this band did! Moving on to horn bands reminds me of James Holvay's influence on that scene. Sending to my friend who sent me this record way back in the early 80's. Even sending to the guy who likely called and asked for copies from Macomb, Il! For all of you, author Stuart Shea has written several books over the years and has long been a friend of mine. Stu, I thoroughly enjoyed this essay and hope some of you also enjoy it and let Stu know it. Hey, music lovers. Just wanted to alert you to a new post on my blog. I've done a long-form interview with the 60s band The Monteras, who hailed from the north side of Chicago. Lots of amazing period photos, memorabilia, song clips, etc. as well. Our buddy Rich Appel has a brand new series running in Billboard Magazine ... re-evaluating the charts based on today's criteria. He brings up some really good points here (and proves once again how this CONSTANT saturation of the airwaves has made HUGE hits out of records that had mediocre chart runs at best back at that time. I get the whole Journey / "Don't Stop Believin'" thing ... and "Sweet Home Alabama", too, a record I must turn off five or six times a day ... but seriously ... "All Along The Watchtower" over-taking "Hey Jude"??? "All Right Now" by Free bigger than Simon and Garfunkel's classic "Bridge Over Troubled Water"??? Have you seen what I’ve been doing for Billboard? Hope all is well. Love reading as always.